I have such great news today!! 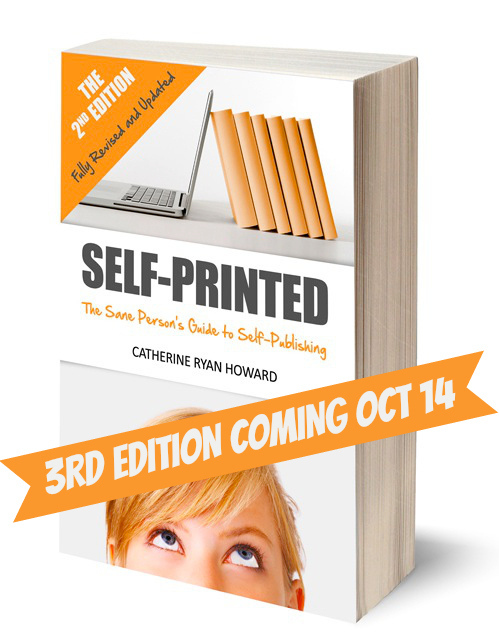 Catherine Ryan Howard’s completely revised, completely updated, and completely new Bible of the Self-Publishing world, Self-Printed: The Sane Person’s Guide to Self-Publishing (3rd Edition), is out now in paperback and ebook and available from Amazon!! Anyone who has ever visited the For Writers page on my website, or attends Writers and Scribblers meetings here in Durango, knows I’m a fan (a huge fan) of Catherine Ryan Howard’s AMAZING site, Catherine, Caffeinated. I subscribe to her newsletter, I cite and share her information a lot, and in August, she announced she would be releasing her third edition of Self-Printed in October. She also said authors were welcome to ask her questions about the book in return for posting the answers on our social media sites. Yes, yes, and YES. I sent her a question. Actually, I sent her a bunch of questions, because sometimes I fail. Catherine kindly pointed out that each person could ask one question, and allowed me to pick one from my list, and she also answered my question about her order at Starbucks. Here is a lovely picture of Catherine: writer, self-publisher and caffeine enthusiast from Cork, Ireland. Her order at Starbucks is always a venti wet latte extra hot. This information is second only to knowing that her 3rd Edition of Self-Printed is out. Catherine has also published memoirs and a novel. about her year (and a bit) working on a J-1 visa at a hotel in Orlando, Florida. about her adventures in Central America after she was finished working in Orlando, Florida. Since I’ve taken two trips to India, and my second trip involved backpacking in the Himalayas, I read Backpacked with joyful abandon and total delight. Catherine Ryan Howard is a great writer, super funny, super witty, super smart, and that is why she is simply amaze with her self-publishing information and tips. Do you address the topic of Advanced Reader Copies and how to use giveaways on Goodreads in Self-Printed 3.0? In the traditionally published world, reviewers are sent advanced reader copies (ARCs) or proofs. These are rough-and-ready paperbacks put together just so the publishing house has something to send out when the actual finished copies are still months away. Usually they have a different cover to the finished product, haven’t yet been proofread and are marked with warnings like“Uncorrected proof copy – not for resale or quotation”. They’re likely to have typos or other errors but the reviewers who receive them know this, and overlook them because they know it’s an unfinished book. They may also be printed on flimsier paper or cover card than the final book will eventually be. 1. Put your copy-edited but not yet proofread text into an MS Word template provided by CreateSpace, but don’t worry about page numbers or any of that stuff. 3. Use Cover Creator + your Canva (www.canva.com) Kindle cover to make a cover for your proof copy. One of CC’s many templates is a cover whose whole front is taken up with a photograph and whose spine and back cover can be left blank or just have some text added to it. Insert your Kindle cover as the “front” picture and then type something like “Advance reader copy – not for resale or quotation” on the back. Leave the spine blank. Finalise your book and then order as many of your new proof copies as you like. Alternatively you could order your maximum five proof copies at the proofing stage and send them to your reviewers. If you need more than five, re-upload your cover or your interior. You’ll have to resubmit your book then (even though strictly there haven’t been any changes) and once it’s done, CreateSpace will come back and invite you to order a new proof (which will be exactly the same!) and there you go: another five copies. Catherine Ryan Howard’s work is the self-publishing author’s dream resource. Her tips and advice are awesome. Even traditional publishing houses cotton on to her savvy. I’ve been sharing the information in that blog post with members of Writers and Scribblers. In fact, this blog post was the topic of our October meeting. If you are a self-publishing author, please join Catherine’s train of awesome and check out Self-Printed 3.0. You’ll be stuffed with self-publishing smarts like Garfield chowing down on lasagna. And if you aren’t trying to publish your work, but know someone who is, please send them this information! Spread the good news! Help turn your writer friends into smarties concerning the incredible undertaking known as self-publishing. You will be Buddha to them! Handing out the Four Noble Truths and the Eightfold Path like a boss. Yeah, it really is that awesome. Selling 100,000 copies is a massive success. Heck yes to success! I’m all for it.